For years, the narrative in retail has followed the rise of online shopping at the expense of physical stores, but according to a new study the growth of online commerce has hit a plateau, and consumers in most retail segments are as eager to shop in bricks-and-mortar outlets as they are to embrace drone-based deliveries. In a report based on this year’s “Future of Retail” study by Walker Sands Communications, a public relations and digital marketing agency for B2B technology firms, authors Dave Parro and Erin Jordan provide retailers with four predictions for the coming year, saying that if businesses want to increase their market share they should focus on integrating their online and in-store experiences, with a focus on mobile payments, speedy delivery, and luxury goods. Walker Sands has been conducting the study, which analyzes the adoption of retail technology with a focus on consumer reactions to such potential game-changers as drones, virtual reality, and mobile commerce, since 2014. The present survey was conducted online in February and involved around 1,400 respondents across the U.S. The suggestions that Parro and Jordan extrapolated from the survey are below. While the number of consumers who shop online has remained relatively steady, the number of purchases they make has gone up: 31 per cent of consumers now shop online at least once a week, according to the survey, compared to 22 per cent in 2014. Meanwhile, the number of consumers who shop less than once a month has dropped from 38 per cent in 2014 to 27 per cent today. 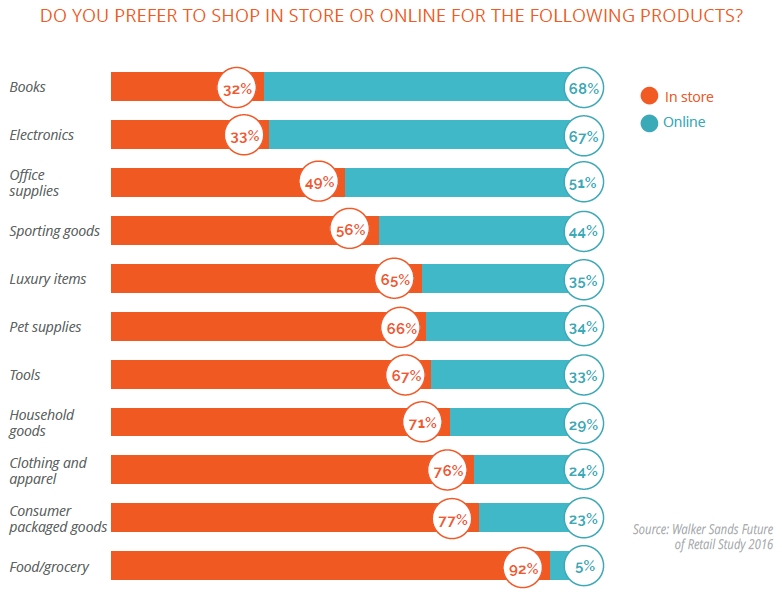 When respondents were asked how retailers could persuade them to shop online more frequently, reduced and/or more affordable shipping times were usually the answer: 88 per cent said that free shipping would encourage them to shop online more often, while 69 per cent said one-day shipping would help, 68 per cent said that free returns would be an incentive, and 49 per cent said same-day shipping would do the trick. “Consumer expectations are higher than ever for free and fast shipping, making flexibility with returns and fulfillment more important than ever,” Parro and Jordan write. The barrier to implementing these changes, of course, is current supply chains, particularly transportation and logistics. Only 19 per cent of the top 250 retailers are capable of fulfilling omni-channel demand profitably, the researchers note, citing a recent survey by consultation firm PwC and JDA Software – and to be fair, 71 per cent of executives in that survey cited omni-channel fulfillment as a top or high priority for future investment. One other result worth noting is that consumers appear excited by the possibility of receiving their packages by drone: more than 70 per cent of respondents said they expect to receive their first drone-delivered package within five years, Parro and Jordan write, and 79 per cent said they would select drones as a delivery option, with most adding that they would be willing to pay up to $10 USD if it meant they could receive packages within an hour. The ideal approach, Parro and Jordan write, is one that is omni-channel, using technology to augment the in-store experience instead of replacing it. “In the coming years, we expect to see that consumer preference for buying specific products in a brick-and-mortar store or on a website will decline, and most shoppers will gravitate toward the best brand experience, regardless of physical or virtual location,” they write. In particular, Parro and Jordan note that consumers are more receptive to location-based smartphone technology than retailers might think: 67 per cent of respondents said they could see it improving their in-store experience, with coupons, product information, and in-store maps all potential incentives to download a mobile retail app. Another potential future channel might be virtual reality technology, which the authors note could be used in fitting rooms: one-third of respondents said they would be more likely to shop at a retailer that offered VR. While luxury commerce has had a slow start online, more than four times as many consumers used the Internet to make luxury purchases during the past year compared to two years ago, Parro and Jordan write – an indication that the luxury industry is seeing much higher growth than many other areas of e-commerce. In a 2014 study, financial services firm Exane BNP Paribas estimated that online sales could make up to 40 per cent of luxury sales by 2020. Much of that growth is being driven by millennials: 59 per cent of respondents under 35 said they had purchased a luxury good during the past year, with around 31 per cent making the purchase online, Parro and Jordan write, noting that despite the numbers an estimated 40 per cent of luxury brands don’t sell their wares online. “It’s no surprise millennials expect the online experience they’re used to with the luxury market, so in the years to come brands will need to go online to keep customer loyalty from younger generations,” they write. Despite the rise of mobile payment apps such as Apple Pay, consumers still largely prefer using credit and debit cards for retail purchases, with only six per cent of respondents citing mobile payment apps as a preferred method for any type of purchase, according to the study. However, 64 per cent of consumers between the ages of 18 and 25 have made a mobile purchase over the past year, Parro and Jordan write, with 44 per cent of them using P2P payment apps. Is social media a viable tool for disaster relief?